SG-1 visits a world whose people once worshiped Vala as a god -- and demand that she stand trial when she confesses to manipulating them. Priors of the Ori have been busy in our galaxy. They have appeared on 43 different planets, and these are only worlds that have been explored and reported. Vala Mal Doran, (still on Earth while waiting out the evaporation of the invisible energy field between she and Dr. Daniel Jackson) inundates Colonel Mitchell with this point and informs him that she has a good relationship with the people of P8X-412. Hearing this worrying news, Mitchell heads for General Landry’s office to bump it up on SG-1’s mission list. With Teal’c’s temporary return SG-1, including Vala, make for the pyramidal temple on 412. While Vala excuses herself to change her outfit a young man enters the chamber, and upon the sight of SG-1 runs scared. Moments later a throng of his friends have returned, all wielding staff weapons of their god Qetesh. But before SG-1 can state their intentions Qetesh herself appears — and it’s Vala. For their goddess’s pleasure, the inhabitants play out a small sketch detailing Qetesh winning 412 from Baal. Daniel is understandably upset, but Vala intends to continue to play as Qetesh to renounce the Ori as gods. In public, a man continues to spread the word of the Ori after the Prior cured him of his physical disability. Asdak, the local who led the play, continues to believe in Qetesh, saying she will slay the Prior when he returns — and he is scheduled to return — the following day. Vala’s prime intention for returning was to pillage her boxes of treasures, probably the only valuables on the planet. Teal’c insists if she does not tell the truth about herself they will, but Daniel presses her, telling her of how good it will feel to be honest with the culture. She consents. Vala will tell the inhabitants of 412 that she is not a god. Vala is sentenced to death, furious with Daniel for ever suggesting that she be truthful. Asdak is the most outraged. He had devoted his entire life of faith in the service of a false god. But Mitchell and Teal’c manage to sway him to a fair trial for Vala. A “Mal Doran” (a trial set up by Qetesh and named after her host) will be held to determine her punishment. When Asdak reads the charges, including Mass Executions and Mass Torture, Vala and Daniel raise a red flag reminding him that it was the parasite within, Qetesh itself, that had done such horrific things. Asdak is lenient and narrows down the charges to the past four years since Vala has been disposed of the symbiote. At the top of the list is planetary-wide forced labor. The outcome does not look good. But when Daniel’s time comes he insists that the reason the people know about the truth of Vala is not because she was found out, but because she openly told them, in the hopes that they would not make the same mistake with the Ori. But the Prior has returned, intending to argue the people’s devotion to his gods. Daniel maintains his ground in the ensuing verbal match, arguing that superior knowledge does not mean that lesser beings should worship them. But the Prior insists that those who do not bow to the Ori will fall to dust. Asdak declares the Mal Doran closed and instructs SG-1 to return Vala to her cell and wait there until the people arrive at an answer. Asdak returns to Vala, informing her that she will not be killed, but will be imprisoned for life. 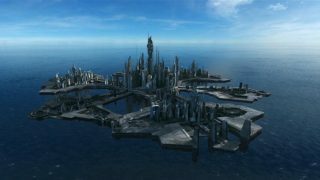 A villager soon arrives and reports that Vashna, the first man cured by the Ori, has fallen ill. Daniel convinces Asdak to allow Vala to see him, and she takes advantage of the residual naquadah in her body to operate a Goa’uld healing device. Vashna immediately feels better, and Daniel explains that it was merely knowledge and advanced technology that helped him. Soon more of the villagers become sick. While Vala uses the hand device on the inflicted Colonel Mitchell asks for backup. Landry sends his daughter Dr. Carolyn Lam and a small medical contingent, all in hazard suits, through to 412. Eventually the hand device stops working, and Asdak, after repeated treatments, dies. Lam says he is only the first, and that there is nothing she can do. Soon Mitchell falls ill as well. Interestingly, Vala, Daniel and Teal’c are unaffected by the virus, and Dr. Lam intends to review their blood work. But this is not enough to stop the population from falling like flies. Eventually the Prior reappears, but since not all of the villagers have converted he is unwilling to do anything to help them. Vala, enraged over the loss of Asdak and the continual dominance of the Ori, arms a P-90 and fires a round at the Prior, but the bullets stop inches from his chest. The villagers have had enough, too, and all of them bow down before the Prior, pledging their allegiance and devotion to the Ori. The Prior pelts the foot of his staff into the ground, igniting the orb, which eliminates the virus from the planet. Mitchell and the others are instantly cured, and even Asdak rises from the grave. The population is sold on the Ori. The Prior comes face-to-face with Daniel. “Tell others what you have seen today,” he says, and departs through a parting trickle of submissive acolytes. “I had a blast writing my SG-1 episode this year. I had all last season to get caught up on all my SG-1 mythology. The new characters are so much fun to write for (not that the old characters aren’t) — Vala is like writer candy. You just can’t go wrong with that character. “I must say, however, that this script owes a lot to the contributions Rob [Cooper] made during his pass. He’s (obviously) got a better handle on writing Daniel and Teal’c than I do. “Martin Gero’s first script for Stargate SG-1 offers a peek at Vala’s dark past, her potentially bright future, and her very colorful present. This episode was actually made up of two different pitches: one about Vala returning to scam a world she once ruled as Qetesh, another involving the healing device and the dilemma it presented. The latter was a notion I’d pitched out but was going nowhere until we started talking about the first story and realized it made sense to marry the two. VOTE! 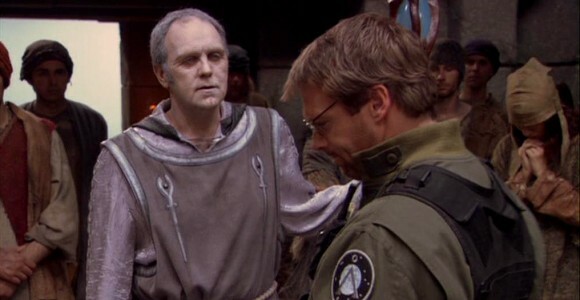 How would you rate SG-1's "The Powers That Be?"